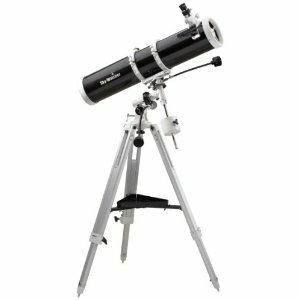 As I blogged a few months ago, at the end of this past spring Amazon put a couple of SkyWatcher scopes on closeout, for seriously ridiculous prices. At one point the refractor was going for just $36 shipped, and not surprisingly they sold out of those, apparently permanently. The 5″ reflector, the 130N-EQ2, was going for $100. Amazon still has those, but if you click on the old link , you get taken to a page where they are selling for an unbelievable $399. This is unbelievable because the list price of the scope and its clones is only $269. They’re good scopes, no doubt, but hardly collector’s items, and I just can’t fathom the 30% markup. ANYWAY, once the scopes on that page went up to darn near $400, interest in them quickly dwindled. But as luck would have it, the 130N-EQ2 is still available on Amazon at a discounted price. This page has them for $150, which is great, but with $44.58 in shipping, which kinda stinks. On the other hand, you still end up with a decent 5″ scope for under $200, which is pretty darned good. 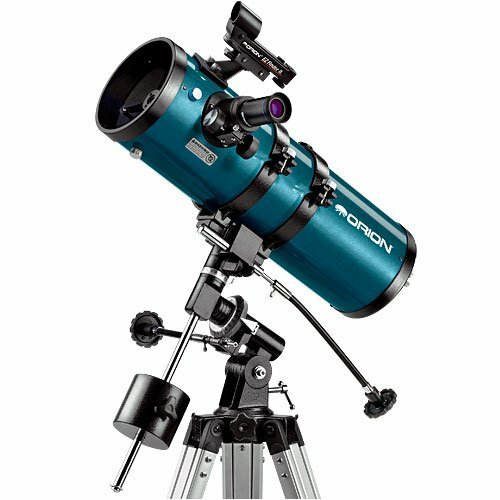 Probably the closest thing out there in terms of price and features is the equatorially-mounted version of Orion’s popular StarBlast 4.5 , which goes for $219 + $10 shipping. So how do the two compare? The StarBlast 4.5 has a parabolic primary mirror, whereas the 130N-EQ2 has a spherical mirror, but the StarBlast has a very fast focal ratio of f/4 compared to the SkyWatcher’s more forgiving f/6.9. The spherical mirror of the SkyWatcher means that spherical aberration becomes limiting at high magnification–say, anything over about 200x. On the other hand, StarBlast’s very fast focal ratio means that it will suffer from another aberration, which is coma. In short, the stars toward the edge of the field start to smear out into seagulls instead of nice little points of light. It bothers some people more than others, but the bottom line is that most users (including me) find the StarBlast maxing out between 150x and 200x, whereas in my experience the 130N can be pushed a little higher, to just past 200x, before the image starts to get ugly. So IMHO, the mirrors are pretty much a wash, with the 130N perhaps having a slight advantage. The 130N-EQ2 has a beefier mount, an EQ2 vs the StarBlast’s EQ1, but it also weighs about three times as much so the heavier mount makes sense. The StarBlast comes with two of Orion’s Expanse series widefield eyepieces, which I and most others consider a step up from the Plossls that come with the 130N. Nothing against Plossls, they’re good, solid workhorse eyepieces, but the wider apparent field of view of the Expanses gets addicting pretty quickly. Both scopes have the same red-dot finder. On balance, the two scopes look pretty similar on paper, and I think both are good choices for a starter scope or a grab-n-go or travel scope. But of the two, I’d still go with the 130N-EQ2. The slower focal ratio means that collimating (aligning) the mirrors is not quite as tricky as with the StarBlast, and the longer focal length makes it easier to power up on planets and other targets that cry out for high magnification. And the little bit of extra aperture doesn’t hurt–a 130mm scope gathers about 30% more light than a 114mm scope, which will mean the difference between seeing something and not seeing it if you really push the scope to its limit. And it’s about $35 cheaper, at least right at the moment. On the flip side, the StarBlast is quite a bit shorter, quite a bit lighter, and has a wider field of view. So if you’re considering either one, think about what qualities you value most. Why is all of this on my mind? Last night I was hanging out with my buddy Andy Farke, and we noticed that after a day of scattered thunderstorms, the sky was remarkably dark and clear. He got out his 130N and 15×70 binoculars and we spent a very pleasant hour just cruising around the sky. We hit just a handful of showpiece objects–the Andromeda galaxy, the Double Cluster, the Pleiades, Jupiter, and the moon–but we spent some time lingering over each one. It has been months since I’ve had observed with a 130N, and I’d forgotten what a good performer it is. Everything we looked at looked darn good. Atmospheric turbulence kept us from pushing the magnification very far, but at 72x Jupiter was showing a lot of detail, with several visible cloud belts in moments of steady seeing. The moon looked downright fantastic–it’s late enough in its cycle to not be overwhelmingly bright, and we spent some time cruising over western features that we don’t often see catching the setting sun (setting on the moon, that is). One of the guys with us lamented not getting a 130N when they were a hundred bucks, now that they had gone up to four hundred, and that reminded me that these fine scopes can still be had for about half of that. I told him so, and now I’m telling you. Finally, if you’ve already got a mount, OPT has a 5″ parabolic reflector on clearance for just $70 plus shipping (UPS, you pick the mode and speed). It’s just the optical tube, no eyepieces and nothing to put it on, but if you’ve got a mount and tripod, it would make a great grab-n-go or widefield scope. That’s all for now. I’m off to the desert tonight for some serious stargazing, so hopefully I’ll have more to report soon. Clear skies! You are currently browsing the 10 Minute Astronomy blog archives for the day Saturday, October 2nd, 2010.